If you use GoodReads regularly, I’m sure you saw the whole “2016 in books” feature that popped up at the end of the year. I never take advantage of their stats because I have so many rereads, and those rereads don’t show up in the year’s review on GoodReads. This year I glanced over it, though, and one fact popped out at me. Apparently, of all the books I read in 2016, Words of Radiance by Brandon Sanderson was ranked highest. Since that was my favorite book of the year, I was quite pleased to see it ranked highest. I was a little surprised, though, to see just how high its average rating was on GoodReads – over 4.75 stars average, with over 90,000 ratings. Usually when I see super-high rated books, they’re ones that only have a small handful of ratings, often little-known books read mostly by friends-of-the-author, or childhood favorites that almost no one bothers to put on their GoodReads lists. So for WoR, with 90K+ ratings, I expected there to be enough poor ratings to drag the average down. I decided to take a look at something. Of all the 1000+ books I’ve marked read on GoodReads, excluding those with the handful of ratings I mentioned above, what was the highest ranked books I’ve read? As it turns out, Words of Radiance is the highest-rated book in my entire list. The only two books higher than it are a virtually unknown play with only two ratings, and a virtually unknown children’s picture book with only four ratings. I wouldn’t count either of those in a comparison. So WoR is top dog here. Then I thought, okay, well it’s a sequel, so maybe that’s just because no one would bother reading it unless they liked the first book, which might explain the bump in ratings. I kept looking down my rating list. The next highest non-one-off kind of book on my list is Crooked Kingdom by Leigh Bardugo, another sequel. After that? The Way of Kings by Brandon Sanderson, the series opener before Words of Radiance. With nearly 150K ratings, it still rates higher than 4.6 average. I guess it’s not just being a sequel that puts WoR so high! Of course, this makes me very happy, because I love that book so much that it very possibly may have displaced Possession by AS Byatt, which has been my favorite book for over a decade now. I wish I could get more people to read this series. I know the books are long, but they are so worth it!!! I messaged Carl on Twitter to see if he has read it because I haven’t and since I read book 1 with him as a read-along, thought maybe he would be interested in another one. He didn’t get back to me, but I really want to reread A Way of Kings and finally get to this one this year. Especially with rumours of book 3 later this year! Last year when I knew I finally needed to read WoR, I reread WoK via audio. That worked out pretty well, since I then ended up listening to WoR, and the audio MADE that story, far better than the print could have imo. I just order them at my Library!!! Excited! Conveniently, I’m reading this drinking my morning coffee! 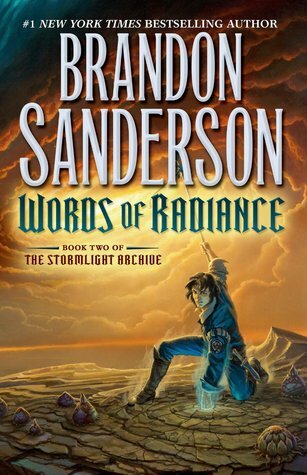 I have been meaning to read Words of Radiance for a long time – I even own it! – but I read The Way of Kings only once right after it came out so I’m worried I won’t remember all of the details well enough … maybe I just need to bite the bullet! P.S. Brandon Sanderson was actually my most read author this year because of rereading the original Mistborn trilogy (and Calamity, which I was disappointed by). He’s so good. I reread the Mistborn trilogy this last year too! Plus a few others – and like I was saying to Kelly above, I actually went back to WoK on audio to prep for reading WoR. I knew I wouldn’t remember it well enough! I finally read the first three in Sanderson’s Mistborn series this year and I loved them. I do want to get to this Stormlight series. Love his stuff. And I love your mug. 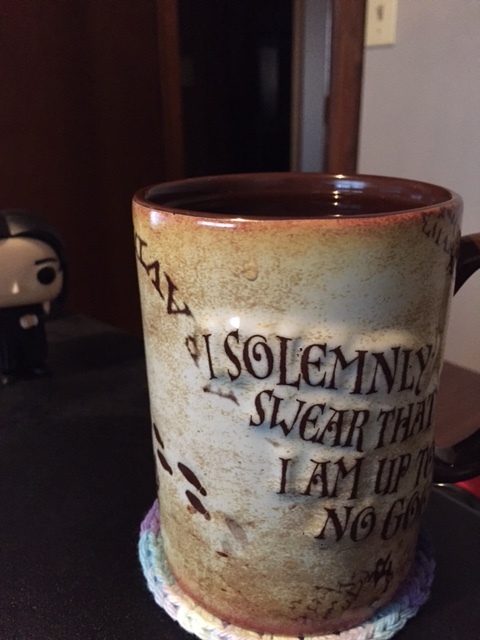 I want that mug. I did not realize those year-end Goodreads reports actually had stats. I’ll admit I did not pay too close of attention to mine. That’s okay. I don’t rate books anyway, so ratings would be meaningless to me but I do like seeing how others rate books.